Christ the King marks the last feast of the Church’s liturgical year. The season of Advent starts the Sunday after. 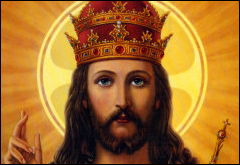 This feast day is about looking at Christ the King as our ultimate leader. The most important part of leadership lies in love. Christ the king shows us that the ultimate power is the power of love. Regardless of what happened to him, Jesus Christ always loved. No one could stop him. His love continued to flow from the cross and reveal the mercy and power of God. The Feast of Christ the King serves to remind us of his love. We are urged not to lose our perspective. Through the power of love, we can effect change in our world and continue to create a life filled with forgiveness and mercy in a world where justice and peace reign supreme. For resources on teaching about the Feast of Christ the King, head to Understanding Faith.